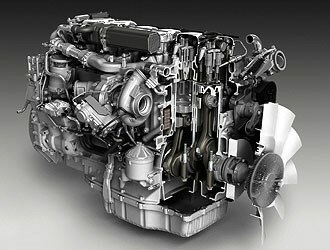 Scania 13-litre Euro 6 powertrain with integrated silencer and exhaust aftertreatment, cut-away. New Euro 6-compliant diesel engines from Scania will be available as five new models. Scania's new Euro 6-complaint diesel engine. Scania Trucks has put its range of Euro 6 emisions-compliant engines on display at the Hanover IAA show in Germany. Two of the four five-cylinder nine-litre engines have an output of between 186kW and 208kW. The engines use exhaust gas recirculation (EGR) in conjunction with selective catalytic reduction (SCR), an approach favoured by most European manufacturers. The other two Euro 6 powerplants develop 238kW 357kw, but use SCR only. 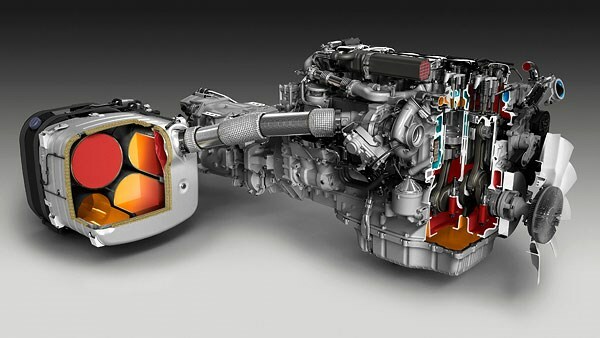 Scania also showed off two new gas-powered engines claiming similar torque and performance figures to diesel engines. With over 1,000 of the new engines already in service, Scania is claiming claiming fuel economy comparable with Euro 5 engines. Of course no display would be complete without the presence of the flagship R730, in this case presented in gleaming silver with the towering Topline cab. Also making news with Scania is a new audio system that will offer satellite navigation along with Bluetooth, an auxillary channel, and USB and memory card accessibility.